The above prayer card comes in two sections, both printable images of the same size, so you can paste the text portion to the back of the image section and laminate it to make a prayer card. 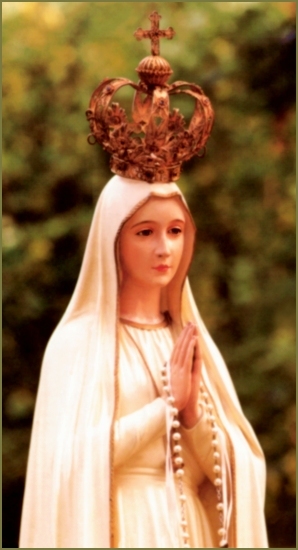 The image of Our Lady of Fatima is in jpg format and the text is a gif image. If you prefer to have only the image but want the actual text in html format, we have provided it below: Each section has a 2 pixel wide green band all around it, to give you a nice finished edge that prints easily. with the intention of making reparation to Me." intercession, all the graces, spiritual and temporal, which we need.